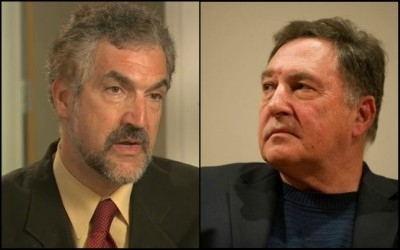 Middle East Forum Director Daniel Pipes (left) and Israel Institute for Strategic Studies Executive Director Martin Sherman. My call for Israel victory has prompted Martin Sherman, executive director of the Israel Institute for Strategic Studies, to write a trilogy of serious and constructive critiques (here, here, and here) for Israel National News. This is how an idea is improved, so I thank him. In response, I shall first recapitulate my thesis, then answer his reservations. My argument: Nearly thirty years of "peace process" has left Palestinian-Israeli relations worse than when they started; therefore, further attempts (such as those Donald Trump is now initiating) are a fool's errand. Compromise and "painful concessions" do not end conflicts; rather, history shows, one side giving up does so. Breaking the Palestinian will to fight will be neither easy nor pleasant; but the only alternative is Israel's disappearance. Palestinian acceptance of Israel hollows out anti-Zionism and will eventually prompt other Arabs and Muslims also to move on. Defeat will hugely benefit the Palestinians, who can finally end their destructive focus on the Jewish state and instead begin to build their own polity, economy, society, and culture. My goal is to convince Washington to let Israel win. My goal is to convince Washington to let Israel win; once this is achieved, Israelis can work out in detail how to attain this goal. Toward this end, the Middle East Forum, the organization I head, has worked with House members to start a Congressional Israel Victory Caucus to urge the president – this one or a future one – to adopt the Israel victory approach. What constitutes victory? Sherman asks 13 probing questions about the nature of victory (sample: How many Palestinian casualties would Israel need to inflict to achieve victory?). My reply: Valid and useful as these questions are, my goal is to change the foundation of U.S. policy, not to work out Israeli tactics. It's premature to deal with the details he raises. Plus, I am an American foreign policy analyst, not an Israeli colonel. Anti-Zionists everywhere. Sherman notes that the Middle East being full of enemies of the Jewish state makes it more difficult to convince Palestinians that the game is over, that Israel is permanent, and that their side lost. My reply: Yes, living in a sea of anti-Zionism does render Israel's job more difficult. But when Palestinians do finally give up the fight against Israel, their centrality to the conflict will enfeeble anti-Zionism from Morocco to Indonesia and from Molenbeek to Dearborn. That shift won't happen instantly, to be sure; but sustaining a more-Catholic-than-the-pope position gets harder over time. A Palestinian defeat marks the beginning of the end of the wider Arab and Muslim war on Israel. The allure of a state after the conflict ends gives Palestinians a reason to behave. No Palestine – ever: Because he sees the anticipation of a Palestinian state undermining Israel's victory. Sherman wants Israeli leaders to announce a permanent rejection of "Palestine." My reply: To the contrary, the allure of a state after the conflict ends offers benefits to both sides. Israelis will be free of ruling unwanted subjects. Palestinians have a reason to behave. The "Humanitarian Paradigm": This is Sherman's alternative to victory. It consists of two steps: (1) Israel's government withdrawing recognition of the twin Palestinian regimes and cutting off all trade and services to them (water, electricity, fuel, postal services, communications, port facilities, tax collection or remittances) followed by (2) its offering Palestinians sufficient money to convince them voluntarily to leave for "a better, safer life elsewhere" in the world. 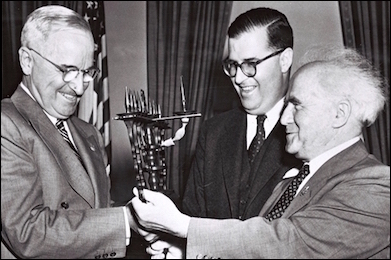 U.S. President Harry Truman (left), Israeli Foreign Minister Abba Eban (center), and Israeli Prime Minister David Ben-Gurion in 1951. My reply: Due to intense nationalism, even stronger social pressure, and likely threats of violence, I highly doubt this scheme will find significant numbers of takers, but it's certainly worth a try. Fighting the "Palestinian narrative": Sherman notes the widespread international acceptance of the anti-Israel line and points to Israel's incompetence at getting out its own message of renewal and achievement. He calls for a $1 billion annual budget really to make the Zionist case. My reply: Good idea. Maybe the new Abba Eban will turn up. Summing up, Sherman and I directly disagree on only one point – Israel accepting the possibility of a Palestinian state. Otherwise, it's a matter of timing, nuance, and emphasis. I'm encouraged that we agree on so much and look forward to working together to promote a goal whose time has come: Israel victory.